You have been patient, my friends. You have made it through the first article, where we looked at how MTFs improve stopped down and saw it was a bit different for every lens. You enjoyed the second article, where we looked at the Best Individual Focus MTF (BIF MTF) which showed how good the MTF could be at different points from center to edge if you focus at that point. By the end of this third article, you will be able to use terms like “the BIF-BAF point”, “the VLOR”, and the modestly named Roger’s Point to both amaze and intimidate your online forum of choice for months to come. It’s like an early Christmas. 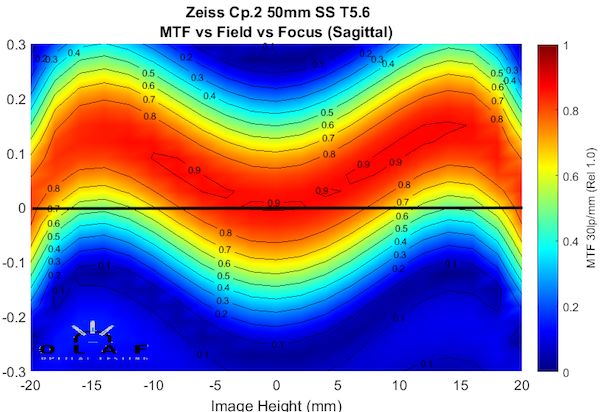 In more concrete terms, we’re going to work with all that data we get with the MTF versus Field versus Focus test to show you something that may also be useful for certain types of imaging; the times when you want as much of the image in focus as possible. That might be a landscape, a group photograph, architectural shooting, or anytime you just want the best overall sharpness possible, and don’t want to shoot stopped-down very far. 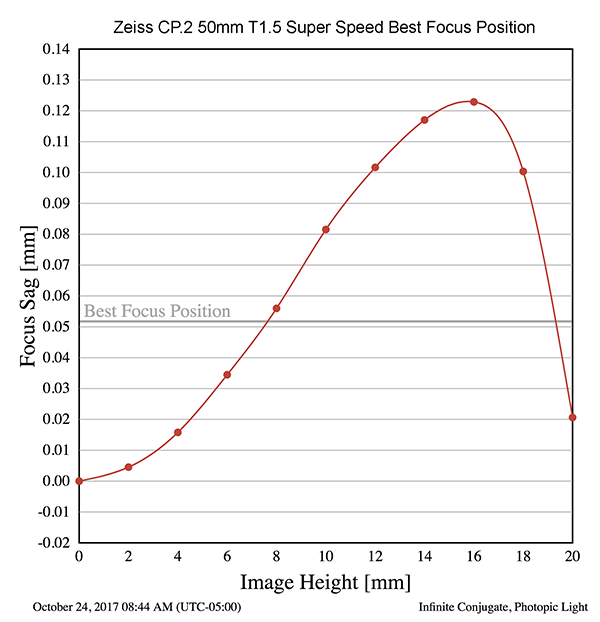 Let’s go back to the MTF v Field v Focus curve I used in the last article, the Zeiss CP.2 50mm Super Speed lens at T5.6. When we take the measurements for the BIF MTF, we also get the exact focus position used to get the sharpest MTF at each point. We can plot that out, too. 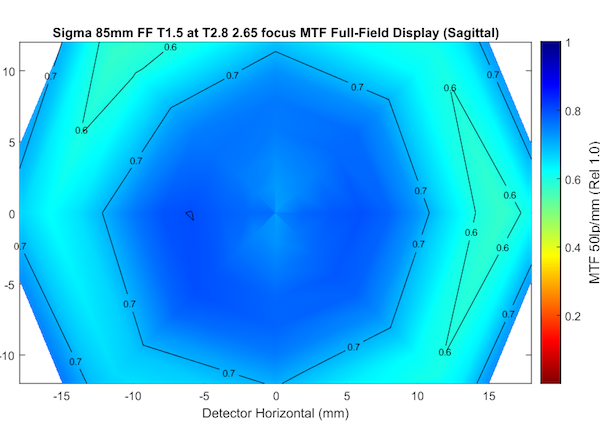 If you scroll back up to the MTF v Field v Focus graph, you can see the best focus position is similar to the curve of one side of the lens (the red area is the area of maximum sharpness). We can run a few more calculations and determine the focusing distance gives the best mean MTF from one side of the field to the other, which we do in the graph below. To give a more intuitive picture, I’ll draw a second bar across the Field graph from above in green, at +0.052mm. As you can see, the image will be a bit softer in the center, but reasonably sharp from side-to-side. This Best Average Focus distance is different for every lens but is easily measurable. 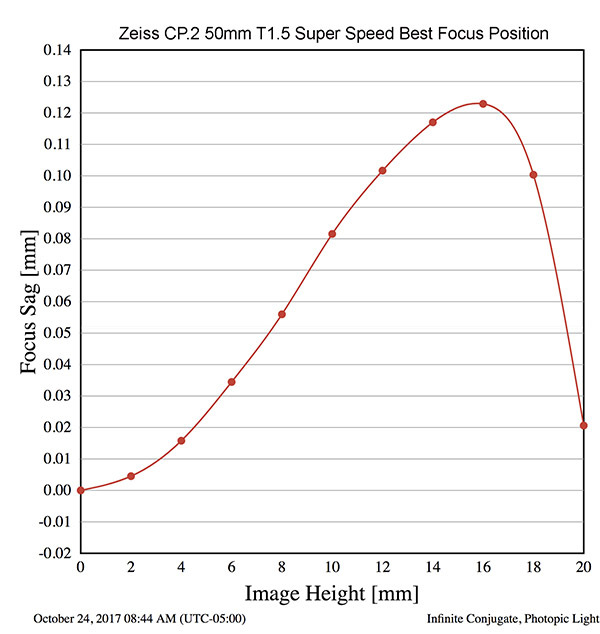 Of course, if you’re thinking ahead, you’re probably saying, “Well, that’s cool sciencey stuff, but how the hell am I supposed to set my camera to focus the equivalent of 0.05mm in front of center focus?” It’s easy; we go back to that ‘best focus’ chart and find the point where ‘Best Individual Focus Distance’ (red curve) crosses the “Best Average Focus Position” (gray line). This, of course, is the soon-to-be-famous BIF-BAF point. The VLOR points to a position some distance between the center and the side edge of the image (we can call this, oh, I don’t know, Roger’s Point). If you focus your camera at this point, you will be focusing at the Best Average Focus Position, for edge-to-edge sharpness. A full-frame camera is 17.5mm from center to side. In the case of the lens above, focusing your camera just over 1/3 of the way to either edge (+/- 7.5 mm from the center) will work. You can do it by choosing an AF point in that area or manually in live view. Obviously, you’ll estimate a bit; you might pick 7mm or 8mm but that will be pretty close. The distance from center for Best Average Focus will vary for each lens. It may also vary a little bit in some lenses depending on aperture (because field curvature can change slightly with aperture) but that difference is probably too small to matter for this technique. Yep. Obviously, it isn’t magic. We’re trading a little bit of center sharpness to get a larger part of the side-to-side image reasonably sharp. Let’s see how it works. 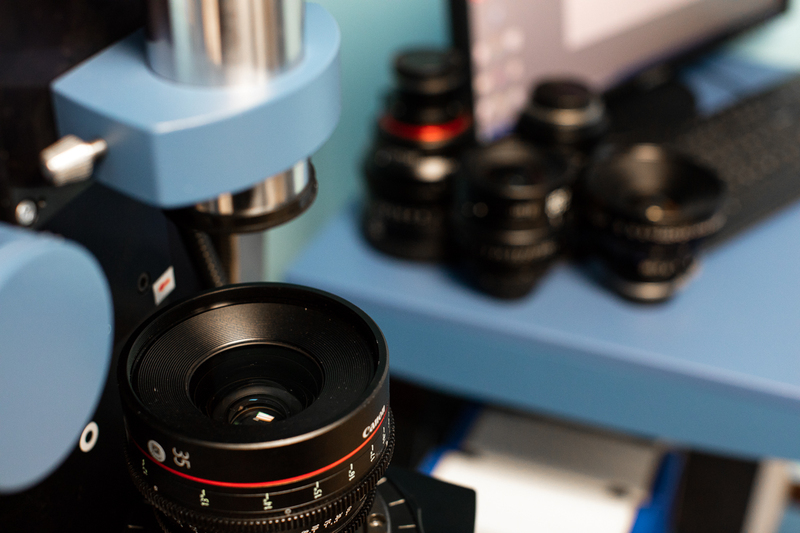 We took a Zeiss CP.2 50mm SS off the shelf and ran its standard MTF, side to side. It’s really sharp for +/- 6mm from the center(about the middle 1/3), then it falls off pretty steeply. Then we focused 0.05mm further than the best center point focus and ran the MTF again. You can see now that the best MTF is at about +/- 6 to 8mm from the center, just as predicted. The center isn’t quite as sharp, particularly at the higher frequencies (fine detail) but an MTF of 0.5 at 50 lp/mm is still good. 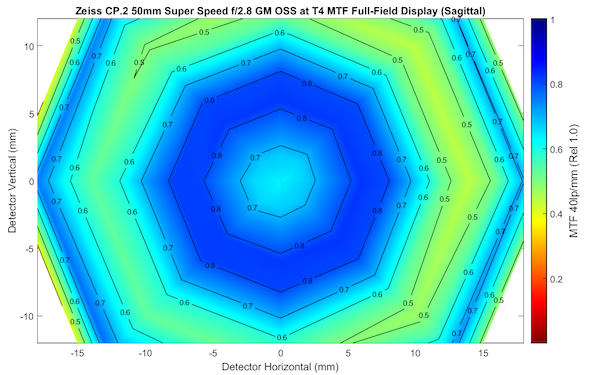 Out at 10 to 14mm away from the center, the image is now usably sharp (high-frequency MTF > 0.3). With center focus, this area had almost lost the high-frequency MTF. With Best Average Focus, the center 2/3 of our image is now reasonably sharp, where with center focus only about 1/3 of the image was. 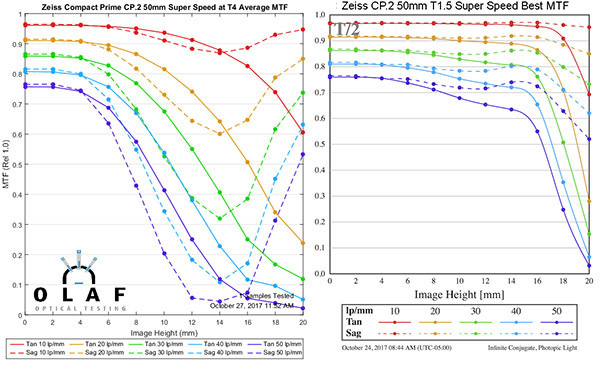 If you want to look at it another way, here are the Full Frame MTF Displays at 40 lp/mm, which is a pretty high resolution. Red we consider unacceptably soft, yellow is borderline. The FFD shows it nicely. We’ve sacrificed the center sharpness from excellent to good, but now have the entire image in the acceptable category. This was at T4; things would be a bit better at T5.6. Again, it’s not a tool you’d want to use for all photography. But when the goal is to get as much side-to-side sharpness as possible, it’s a nice trick to have. It could be useful for landscapes, group photos, architectural shots, and some types of street shooting at any rate. I tried the same test on the Sigma Cine 85mm T1.5. I wasn’t sure that this would make a difference since this lens stays pretty sharp so far from center. I was also interested in this lens because the Roger’s Point was way out at 11mm from center, more than half-way to the edge, which is fairly extreme. Because this lens is so good at T4, I dropped the aperture down to T2.8, so we had a narrower depth of field. The difference is more subtle, but it’s there. 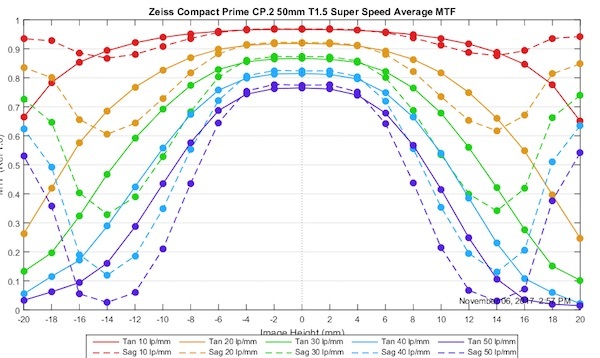 Follow the 0.9, 0.8, and 0.7 MTF lines out, and you’ll lens has a higher MTF at each frequency away from the center. Here is the standard MTF on top, and the Best Average Focus MTF (BAF-MTF) below. It’s more apparent if I use the Full Frame Display MTF. I’m doing this one at a higher frequency, 50 lp/mm, because the Sigma 85mm T1.5 can handle that, which many lenses can’t. Again, center focus MTF is on top, BAF MTF on the bottom. 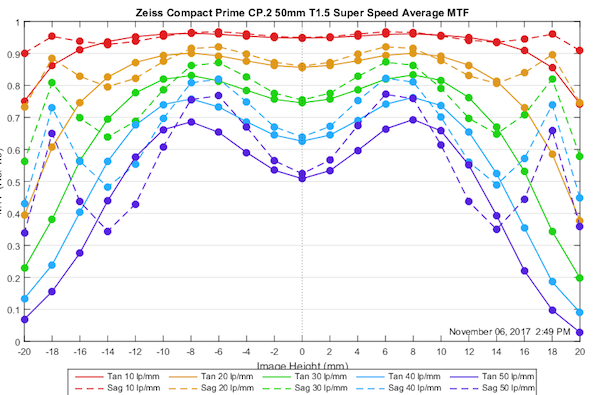 I’m not going to (at least right now) show you the MTF curves for every single Cine lens we’ve tested. I’m just going to put up a table of the focus position that will give you the Best Average MTF. One of the questions I have is, do people really want the BAF MTF curves? I think the field curvature graph and BAF Position would be sufficient. If people really want to see it, we could either just show the BAF Position and the VLOR graph (scroll way back up). 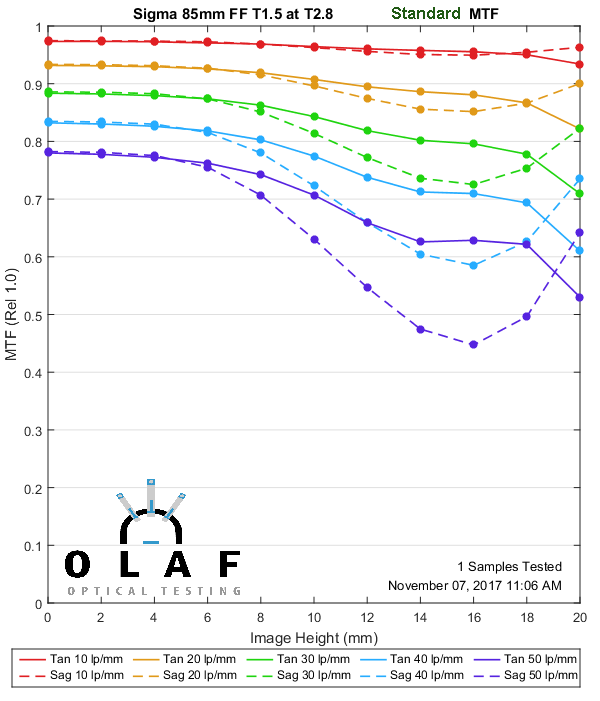 And I guess we could show give the BAF MTF curve for each lens. 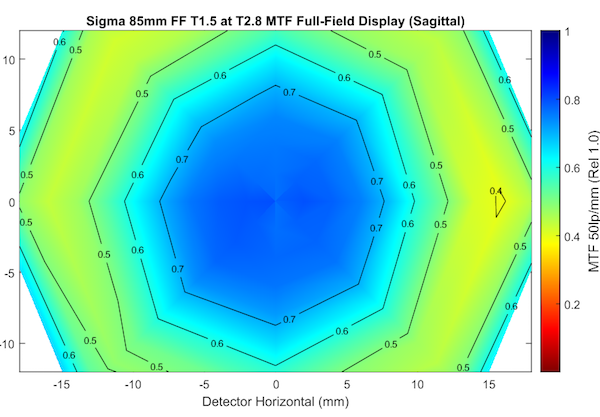 Personally, I think the FFD MTF graphs (the colored circle showing the image field) are best for that purpose. Until our software upgrades are finished, none of this is automated, though. So, for now, I’m just going to give you the BAF Positions for the Cinema Primes we’ve tested. (They are the same for the photo lens version of each lens.) Since a full frame sensor is 17.5 mm from center to side, it should be fairly easy to estimate where to focus to obtain BAF. You don’t need to count mm, we ran these a bit to either side, and there was no detectable change, so ‘just short of halfway to the edge’ or ‘about 1/4 of the way to the edge’ is accurate enough. I’ve made the table sortable so you can look for a pattern, but I don’t see one myself. I have no idea. I can see it being a sometimes useful tool. If I did a lot of weddings or group photos, I’d keep the BAF in the back of my mind. It’s kind of counterintuitive to focus on the 3rd lady from center, but it might keep everyone in even focus in the group photo. For landscape photographers it might help when just stopping down isn’t getting everything as sharp as you want. Or perhaps to let you get the shot at f/8 instead of f/16. Whether that means there’s enough demand for us to publish either the BAF number or the focus curve graph when we do reviews, I don’t know. 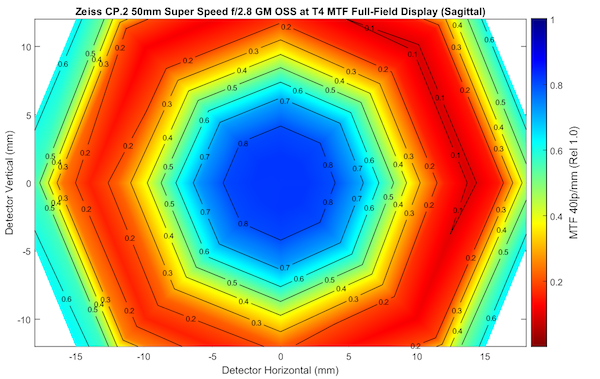 A lot of times you could probably eyeball it by looking at the MTF v Field v Focus graphs. So I’ll wait for your input on making that decision. But I think it’s an excellent example of lenses are tools, and the more you know about the tool you’re using, the better you’ll be able to use it. Knowing how far from center the BIF-MTF stays sharp, and where the BAF MTF point is are useful things, no matter how geeky the technique we use to find them is. ” If I did a lot of weddings or group photos, I’d keep the BAF in the back of my mind” — not sure, really, because your wedding guests will probably not line up on a plane. These numbers are certainly super-useful for reproductive photography (photos of paintings, books where you can’t use a scanner) and many scientific applications that need a sharp imige of a planar surface, but I’m kinda thinking it might be easier to get the wedding party to align with your lens’ focus surface than the other way round. So the plots should allow me to make this type of conclusion (arbitrary example numbers): If I focus on an object in the image center, then at 1/2 image width, the best focus is 10% further away from the camera than the object i focussed on. That should make it easier to work out where in space the focal surface ends up. How does BAF compare to hyperfocal technique (HT)? I’ve used HT for distant landscapes with all kinds of film cameras and with a Zeiss 100mm Makro on a Canon 5DsR (an astonishingly good combination). Did I just happen to hit on a lucky combination of great hardware and sufficiently accurate HT lens markings that coincide with BAF? My name is Roger. Roger of LenRentals. I arrange, design, rent and sell lenses. Is there a good rule-of-thumb to eyeball it based on the MTF vs FvF graph? 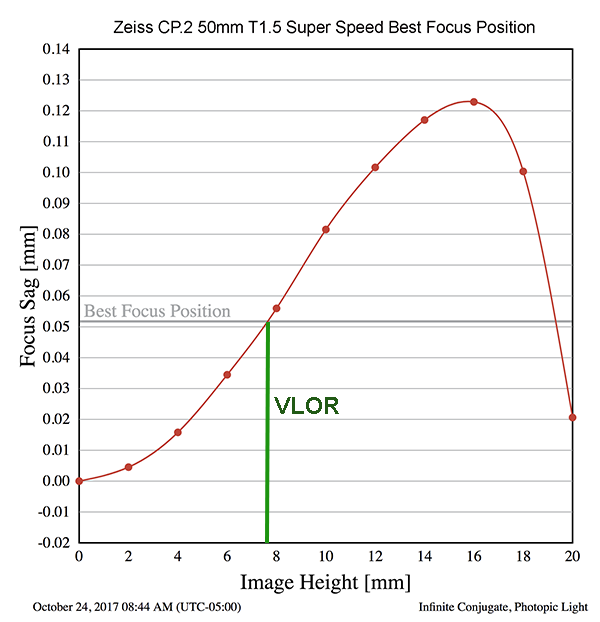 I have recommended this kind of focusing to our Lenscustomers for years now. Especially for Shift Lenses this is an essential improvement. Especially as you may not even see the center of the original image circle at all. I would even expand this and say adding a tiny bit of tilt to a shifted lens may defeat field curvature even better when there is significant amount of shift. Thanks for all your great work ! I find this information very useful in that it shatters the myth that the best overall focus at infinity is created by focusing as sharply as possible in the center. Thank you so much for this interesting and useful post! I would be happy to get the BAF for as many lenses as possible. May I propose, that you add a number for front- back- focus relatively to the reference “center focus point”. This way, I could guess easily, how much it matters to use BAF or center point for a certain lens. I really appreciate your work and read all your posts! I wasn’t sure from the article how you do an average to come up with the off-axis focus point at which you find the Best Avg Focus. It sounded like you were weighting the average linearly along a radius from center to edge. But if you want maximum sharpness at all areas in the image, shouldn’t the weighting be by area (that is by the square of the distance from the center of the field)? This would push “Roger’s point” further out in the smiles and moustaches that you show as typical field curvature results. Holy Cow, Batman! BIFF!! BAFF!! On the comic book pages of decades past Robin made camp comments while Batman socked the bad guys on the chin to the accompaniment of sound effects. Now, these humorous addenda have found their true place in history, as useful new tools for the consideration of lenses. All kidding aside, I’m not kidding. The bridesmaids will thank you. Rectilinear lenses make the people at the edges look fat. And that is why “barrel distortion” is a good thing. I find a stereographic projection to be much more pleasing for group photos if I have the opportunity. Highly interesting, thanks for your article! And all others as well, this is a cool blog at its entirety. Now I am wondering about using focus-and-recompose (F-R) technique to focus according to the rule of thirds. Since the F-R may “by definition” result in focusing at different distance than the object is placed (a well known issue), I guess the field curvature may cancel out this issue on some lenses and worsen it on others. So while two different lenses are perfectly fine, if a photographer is frequently using the F-R, one lens suit their personal needs much better then the other precisely because of this combination. Actually I hadn’t changed it until this morning. Yesterday was one of those days. OK, I have been ignoring Nikkors a little bit lately. I’m going to do this, over the next couple of months for all the major primes, and I’ll make sure the Nikkors are first or second. Actually, I’m interested to see because Nikkors emphasize a flat field to start with. It may be of less benefit with them, but we’ll definitely check post them. Definitely useful*. But I’m not good at mentally dividing numbers by 17.5. I’d rather get the information in % (i.e. 6mm becomes 30% which means I have to focus 30% away from the center, right on the rule-of-thirds marker). * The stuff you usually publish is useful when looking at which lens to buy, this doesn’t help much that way, but once you’ve chosen a lens this will help you get the most out of it. Genius, genius, genius!!! Lifesaving information that I need in my daily work!!! Thank you, thank you, thank you!!!!! We will write and publish a paper that explains the algorithm within the next year or less and publish it in an open access journal. It is related to my thesis topic and not currently public. Nikon does manufacture cinema lenses. You will notice that each lens here is a cinema lens. Manual focus Nikkors have been a mainstay in independent cinema for quite some time. There’s an interesting test of the lenses here. I think you will now become famous as this might catch on as the next ETTR technique. The only problem is now you will get 1 million lens test requests. Looking at the data a possible general rule depending on camera and focus point density, would be to always use the 3rd or 4th focus point to the right. Awesome info that makes complete sense; I will immediately start focusing on the third lady from the center in group shots. One small request: Could you at least pretend like you thought about including Nikkors in your blog posts. Ah! Now I understand. I think that you could do that, with a little trial and error. Setting the AF (via micro focus adjustment) to focus a bit further … does that means that i can tune it to back-focus constantly with a 0.05 focus correction (considering i do correct microadjustment + the required delta)? That would basically allow one to use the center AF point while shifting the focus point with the BFP modifier (so obtaining the same effect as focusing at BAF distance). After all micro-focus adjustment does exactly that, focus and adds a focus delta, right? Roger, this is something completely new and extremely useful! THANKS!!! 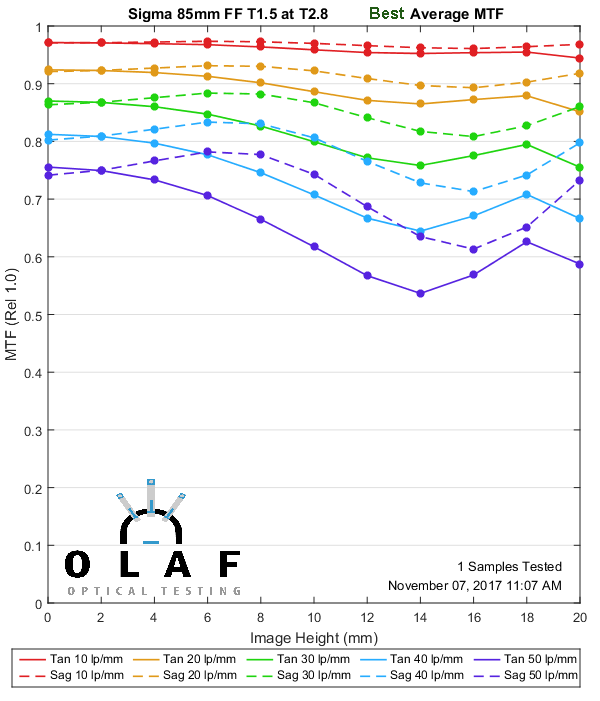 You’ve introduced new and meaningful graph for lens testing and use! CONGRATS! Whist the previous post was not so clear for me (I mean the practical aspect of that info), this article now gives the easy usage scenario. Thanks for the insights – reminds me my lack of knowledge is vast – will have to live with it as I don’t have the time or budget to remediate it. This series is a goldmine. Adrian, in-camera adjustment, as in micro focus adjustment, etc. has nothing to do with this. It’s basically fine-tuning the cameras AF system to the lens. So a separate maneuver. I think what you suggest is very practical. The concept is one I’ve never considered before, and I can see lots of ways to use it: like you suggest, as an aid for ‘hyperfocal distance and leave it’ shooting, etc.